Most athletes and a fair share of non-athletes have been there. The nature of our profession is that for the most part, we see people when they are down and out; our job is to diagnose the damage and to build them back not just to par, but to stronger than they were before the injury. My usual position as a Physiotherapist is to guide my patients from the tough day of diagnosis, through the often lengthy rehab process and safely back into their return to sport. We often get quite close to our patients and as athletes ourselves, ride the journey with them. In 2013 I was unlucky enough to flip the coin and be the one sitting in the sports physician’s office trying to swallow the gravity of my own injury situation: a stress fracture gone wrong following my latest Ironman triathlon. I think in this situation it’s arguably easier knowing less rather than more – I knew before the lovely Dr Chris Ball told me that I was looking down the barrel of major foot surgery, and a very long time away from my beloved sport. What it looks like to finish an Ironman on a broken foot…it ain’t pretty! First and foremost, immediate questions need to be asked: What is the best course of treatment for short and long term outcomes? What are my options? (often there are a few good ones, especially where surgery vs conservative treatments are involved). How long will I have off my sport? Will this affect work/school etc? Once a course of treatment has been set that you as well as your health care team are happy with, the less urgent but just as important questions need to be asked: What went wrong? What will I do differently next time? Where is the weak link in the chain? How do we (as in, you and your Physio +/- surgeon and sports physician) build the body back to a point where it’s stronger than before? How can I prevent this from happening again? Do we need to change things upon return to sport (training load, technique, footwear etc)? Knowledge is power, and I cannot reiterate enough that you need to ask and ask until you get the answers that you need; your sanity during your rehab and your ability to avoid injury in the future depends on it. If you aren’t happy with your physio/doctor/surgeon, then find another one – you need to find the best quality care at all costs to get the best results. So you found that mystical line in the sand, the actual safe limit of what your body can achieve; many never find it so you can take one thing away from the situation and that is that as an athlete, you are tough! But going forwards, if your injury was “overuse” in nature (ie stress fractures, tendinopathies etc) then you need to respect that boundary. 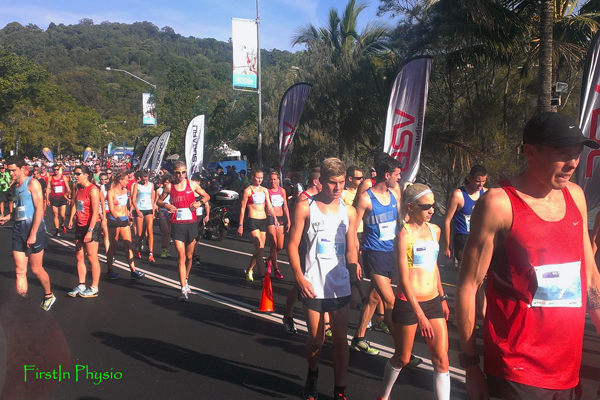 Learn from it and take note of your body’s cues in future training and racing scenarios. If your injury was more traumatic in nature (eg broken tibia from a soccer clash or dislocated shoulder from a cycling accident), then there’s not a lot more you can do other than accept that playing sports involves risks. Given a choice, you’d still take those risks to sitting on the couch getting fat and unhealthy, right?! 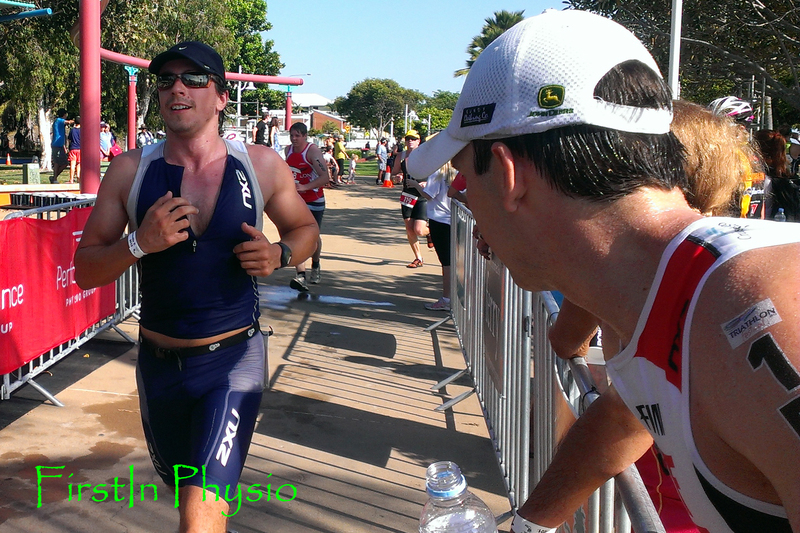 There’s nothing better than that moment your surgeon (or doctor or physio) gives you the go-ahead to do some exercise. Even if it’s technically “rehab” – “I’ll take it!” you yell as you hug them (Ok exaggeration. Only slightly though.) Prior to a major injury you may be guilty of complaining when the alarm clock goes off at stupid o’clock, if it’s cold/hot/raining; if the session is too hard…or not hard enough….If your race didn’t go perfectly, and so on. Afterwards I can honestly say that every single step I take is done with an “attitude of gratitude” – my coach and husband will vouch for the fact that every run is a bonus, every race is a bonus, and I am thankful to be able to have a fit, strong and healthy body again. Hell, I’m even grateful to be able to do the housework these days – taking an independent person and attaching them to crutches for 3 months is enough to send anyone crazy! I have been guilty of treating my body somewhat like a rental car in the past, but I now appreciate it and treat it much more lovingly (Karma, my friends, Karma…). And by this I don’t mean your ability to push through and “eat the pain” as my husband would say – if you got injured in the first place by pushing too far you definitely don’t need to learn this. But in my experience it’s often the athletes who are able to blindly push through that are also in need of some mental “balance”. I am by no means exempt from this generalisation. I took the time after my surgery to finally learn how to slow down and meditate (I highly recommend it, you’ll never look back), as well as to focus on other things in my life other than training 20 hours a week and working full time. It was not the most fun I’ve ever had – by choice I would much rather be working and training! – but it has taught me a sense of balance which I had never had in my life before, and I think that this has benefitted both aspects of my life well after the initial injury period. For most athletes I would therefore consider the slowing down process as “building mental toughness”, even if it’s not the traditional sense of the phrase. A wise triathlete (Emma Snowsill) once said that if you don’t allow your body to rest, it will force you to via sickness or injury. I would put pregnancy in the same category here simply because the reduced training load while you’re growing a human has the same affect – time to let the body take stock. To absorb all the months/years of training it has done, and to build back a little stronger. As physios we educate patients on how a bone will actually be stronger where it broke after the healing has occurred, because extra bone is laid down in the healing process; this is a nice metaphor for the entire healing process of the body. Reassure yourself that you WILL come back from the injury, and that all the training you’ve done in the past will not be gone. So there you have it, my version of what I’ve learnt through injury in a nutshell. I’ve kept many details of the injury and whole rehab process pretty close to my chest up to this point; as a physio it is not the easiest boat to be in. Physiotherapy may be my “day job” and I certainly love it, but I am first and foremost an “athlete” and in the past have certainly had trouble switching that part of my personality off, even if the Physio part of my brain is telling me something is a bad idea. As I get older and more experienced with both Physiotherapy and Ironman racing, I am learning how to strike the balance but it is always a work in progress. I am very fortunate to have two very patient and understanding men in my life in my husband Patrick Shannon and my coach Scott DeFilippis. Without them I would not be on track to be lining up again for Ironman NZ in 4 months’ time – 1 year post-baby and just over 2 years post foot surgery. Hopefully this post will hit home with a few “broken” athletes out there and help to get you through and back to your passion. If you would like to follow my journey back to the Ironman start line you can find me on Instagram (@KRISTY_SHANNON), I’d love to have you along for the ride! Often parents are unsure when to seek the opinion of a Physiotherapist in dealing with their active kids. Now more than ever, kids and adolescents are getting involved in organised sports, with a multitude of social and health benefits to be gained from their participation. It is not unusual to see kids that are actively competing in several different sports every week, often with once- or twice-daily training sessions and multiple weekend games or competitions. Combine this activity with the demands of growing on a young body and you find the balance is a delicate one: get it right, and the child thrives; push too hard, and it doesn’t take long before niggles and burnout can arise. Research tells us that sport is the main cause of injury in adolescents (Brukner, 2008). The number of under-15’s seeking medical attention for sporting injuries increased by 60% between 2004 and 2010. This can be attributed to an increase in kids’ participation in organised sports, improved diligence by parents in seeking medical care for their children’s sporting injuries, and higher levels of competitiveness (or skill) in children of younger ages. Redness or swelling around the painful area. A Physiotherapist will be able to diagnose the injury, develop a treatment plan, and work on prevention strategies so that the injury is less likely to reoccur. If scans are required to assist diagnosis, these can be ordered through the Physiotherapist. The earlier treatment is sought, the easier the injury will be to treat and as a general rule, the less treatment sessions that will be required. Don’t feel like your child needs to be in severe pain or unable to participate before you book an appointment – a good Physio will be able to find their diagnosis no matter how “mild” you may think their symptoms are. Keeping a child active and involved in their sports is always a priority and this is much more likely to happen if the injury is seen to at an earlier stage of its progression. The wonderful thing about children and adolescents is that their bodies have a marvellous capacity to repair and respond to increased training loads (otherwise known as: “kids bounce”). Generally, we can use the same principle in treating injuries that arise: in the majority of cases, kids can continue participating in their chosen sport(s), albeit with a few modifications to unload the injured area and allow it to heal. They are a beautiful example of what we also see in adult athletes: that when we are able to keep the body active through injury, in a safe and supervised way, the body heals faster and is able to bounce back stronger than it was before the injury. Our bodies like to move, and they respond favourably to the increased circulation, muscle mass, and the hormonal response that comes with exercise. Children and adolescents with a history of recurrent injuries or niggles. Pain that is causing vomiting or nausea. The key point to remember is that early treatment results in less time away from sport, and generally less treatment. Physiotherapists work very closely with other allied health professionals as well as doctors and specialists, ensuring that any patient that requires referral on will be obtaining the best possible care and follow-up. For more information and advice, contact your local Physiotherapist. Brukner, P., Kahn, K. Clinical Sports Medicine. Revised Second Edition. (2008). McGraw-Hill Australia Pty Ltd. The American College of Obstetricians and Gynaecologists recommends the accumulation of 30 minutes or more of moderate intensity physical activity on most, and preferably all, days of the week during a normal, healthy pregnancy. We now know that exercise – whether in the form of running, swimming, Pilates or anything in between – is hugely beneficial from pre-conception right through to the post-partum stages. Answering any of your questions about exercise during pregnancy – from elite athletes through to previously sedentary mums-to-be. Common questions include: “how hard can I go?”, “Is it safe to run/ride/strength train while pregnant?”, “what precautions do I need to take while exercising?”, “what are the warning signs to stop exercising?”. Managing early return-to-exercise programs post-partum. Pregnancy is a wonderful time full of many changes both physiologically and emotionally. Always check with a health professional (your Doctor, Obstetrician, Exercise Physiologist or Physiotherapist) before starting any new exercise program. No referral is needed to book in with an Exercise Physiologist or Physiotherapist. Our professional staff maintain constant communication with your doctor and Obstetrician, to ensure that everyone is up to date with your exercise and health plan throughout the pregnancy and beyond. Pinto, Kristina. ; Kramer, Rachel. Fit and Healthy Pregnancy: How to stay strong and in shape for you and your baby. VeloPress books, 2013, Boulder, Colorado. Every budding ballerina dreams of the day she can one day transition into pointe shoes and dance up on her toes; indeed, many years of foundation training and development go into preparing a young dancer for this exciting stage in her dancing life. However, along with the excitement comes much more demand on the body and a higher risk of injury. Even with optimal technique, dancers who wear pointe shoes are bound to experience wear and tear on their feet. In adolescents, overuse can also be a very common problem – we see a sharp increase in dance injuries as students build up their hours leading into exams and eisteddfods (typically in the middle of the year), and then towards concert time at the end of the year. Dr Justin Howse, former orthopaedic surgeon to the Royal Ballet School, states that “no dance-related injury is an act of God”. 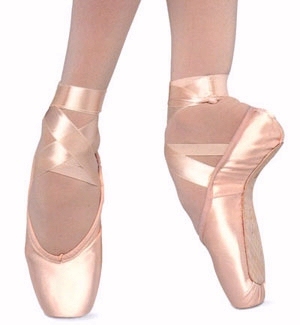 Variables such as the time spent dancing per day/week/month; experience level; anatomical limitations; technical knowledge; quality of teaching and quality of shoe fitting; history of previous injury; surfaces on which dancing is performed; and strength and conditioning level are among the factors that determine the likelihood of sustaining a pointe-related injury. – Get your pointe shoes fitted by someone with a lot of experience, and especially with fitting beginners if you are just starting en pointe. Even if you have to travel to do this, it is worth the investment compared to having to see a physio and have a lot of time off later when injured. – Take your time getting onto pointe. There is no “right” age to start – every body and dancer is different. A dancer is ready when they have done most of their growing, have very good technique, flexibility and strength, and when their teacher feels it is time. For most dancers this is between 12-14 years of age. Going on pointe too early can cause a host of injuries and developmental issues in the feet – some irreversible. Not to mention the cost of replacing pointe shoes every few months during a big growth spurt! – Get a pre-pointe musculoskeletal assessment from someone qualified in assessing dancers. This is usually a physio with a special interest in dance. These assessments pick up any potential areas of weakness before they have a chance to cause you problems en pointe. – These days there are a host of padding and toe spacing options to fit inside your shoes, but you do not need to have every single one of them. I often see young dancers coming in with shoes full of bits and pieces and as a result, they lose the ability to control the end of the shoe well. Experiment with padding and spacers, and do what feels best for you. – Do not wear ribbons that are too tight – this cuts off circulation and can hide shoe-fitting problems. – Ensure that you tie ribbon knots on the inside of the ankle, not over the back of the ankle, which can apply undue pressure to the achilles tendon. – Be aware of how feet are used when they are not dancing. Many a foot injury has been blamed on pointe shoes when the dancer is not wearing supportive shoes such as joggers at school or when walking on concrete etc. – If you are having trouble with centre and balance work en pointe, look for weaknesses in muscles higher up the chain – it could be a lack in hip or core strength. – If you have very good muscle strength and still have troubles with single-leg pointe work, consider changing to a pointe shoe with a square box instead of a round one. – Look at the whole body en pointe when trying on shoes. Observe how the shoe affects the alignment of the rest of the body. Beware of shoes that thrust the hips forwards. – Never skimp on warming up and stretching. When the body is not warm enough, or does not have sufficient flexibility to perform a particular technique, something else will pull or strain in order to achieve the desired result. – Whenever possible, take a regular class before a full pointe class. This will assist in warming up the body and help to decrease the risk of tendinopathy from pointe work. – Don’t be “lazy” en pointe. If you are wearing pointe shoes, you must have warmed up, be switched on, and aware of your body. Never mark out dances or go ‘half up’ on pointe because you can’t be bothered in rehearsal – this is where some of the worst injuries occur. If you are marking out or fatigued, swap into your demi-pointes. – Check the wear pattern on the heel of your pointe shoes. If there is evidence of foot contact a half inch or longer on the satin at the heel of the shoe, the size may be too short. – A shorter shoe may create a better line and make the instep look higher, but it can also cause a tendinopathy or a bone spur at the back of the foot. Short shoes also prevent the arch from expanding. Once the elasticity of the arch is lost, the ability to jump is lost, as is the ability to perform deep pliés. – Conversely, shoes that are too big lessen control over movements. A shoe that fits correctly allows full flexion and full ability to spread the arch, as well as control the foot and ankle. A large shoe can cause sprained ankles, overstretched tendons, and overdevelopment of muscles that are straining to hang on to the shoe. – Pointe work is not just about the feet. Remember to strengthen all muscles around the joints, from the foot to the knee to the hip to the spine; only then will you be able to accomplish your maximum range of motion with beautiful control. – Many dancers stretch but forget to strengthen the deep stability muscles, especially around the hip and the foot. Working particularly on the instep and the forefoot will decrease the risk of ankle injuries. – When increasing your dance load or when going through a growth spurt, ice the feet at the end of the day. Muscles swell as you dance, and ice assists in constricting the blood vessels and decreasing swelling and aches. Also pay careful attention to calf length, and stretch more frequently (2-3 times a day). – Ensure that you don’t allow the skin on the feet to become dry and cracked. If this is a problem for you, get into the routine of massaging your feet and toes with Vaseline or a good quality moisturizer at night. – Finally, be especially aware of your form when fatigue sets in. Studies have shown that the majority of ballet injuries occur between 4-6pm, rather than during morning classes. Physical and mental fatigue can lead to increased injury risk. It is important for dancers to learn about the anatomy of their bodies, and what they are designed to do, as they get older and more experienced with dance. When dancers go onto pointe is a great time to start learning about their feet and how to look after their bodies ongoingly. Often a dancer can carry minor weaknesses for a long time without realising that anything is wrong, until a growth spurt or extra rehearsal load comes along and tips their body over the edge. Unfortunately this usually happens right before exams or concert time! Thankfully, many of these injuries can be prevented or at least better managed if the dancer has been looking after their body and knows their body well – it’s strengths as well as its weaknesses. If you are unsure about when is the right time to go onto pointe, whether your body is ready, and how to best transition without the fear of injuries, a dance Physio can assess your body and then work with you and your dance teacher to ensure that you are as ready as you can possibly be. The end goal should always be facilitating the young dancer to achieve their full potential in the safest and most enjoyable way possible. Are you an “Active Couch Potato”? Recently we have seen the establishment of new “Physical Activity and Sedentary Behaviour Guidelines”, doubling the recommended amount of daily exercise to 60 minutes every day and for the first time, addressing our nation of couch potatoes. “Sedentary behaviour” includes sitting or lying down, not including sleeping time during the night. The New Guidelines: How Do You Stack Up? – Doing any physical activity is better than doing none. If you currently do no physical activity, start by doing some, and gradually build up to the recommended amount. – Accumulate 150 to 300 minutes of moderate intensity physical activity or 75 to 150 minutes of vigorous intensity physical activity, or an equivalent combination of both moderate and vigorous activities each week. – Minimise the amount of time spent in prolonged sitting. Break up long periods of sitting as often as possible. Frightening statistics show that Australians are sedentary on average for 7 to 10 hours a day, and this does not include sleeping. The highest health risks exist for those people who are sedentary at work, at home, and who do not do any other formal exercise. However, there does exist another group who accumulate their 60 minutes of exercise a day, but sit for the rest of the day at work. It has become apparent that the health benefits of their exercise bout do not completely override their globally sedentary behaviour, and these “active couch potatoes” would benefit from being more active during their work day as well. I have a sitting job, help! We can actually take away a lot of positives from the new guidelines, most notably that simply being more active throughout your day can start to give you some of the health benefits that those weekend warriors are getting with their 3-hour, one-off bike rides. If you hate exercise, this is good news for you. By being creative and adding activity into your day, you can be doing your body a lot of good. Walking or cycling to work; parking at the far end of the car park or a few blocks from work; going for a short walk to get your lunch; scheduling a “walking meeting” with a colleague; installing a standing desk in your workplace; and drinking more water so that you have to get up to go to the toilet more often are all easy ideas. If you want to get even more creative, you can get in the habit of walking every time you answer the phone; doing 20 air squats every morning tea and lunch break; or setting yourself a task of 20 push ups and a 1 minute plank every time you watch the news at night. Keeping the body moving and the engine revving is the key point. And the best part is, we are creatures of habit: before long, it will be second nature to be moving more (and your body will be thanking you for it). If you haven’t been very active in the past, it’s a good idea to start with small daily habits and then build in more structured exercise as you feel more comfortable to do so. The key is to find things that you can make fit into your work and home life, and ideally that you enjoy as well. Increasing amounts of studies are finding links between sedentary behaviour and weight gain, type 2 diabetes, poor muscle tone, heart disease and early death. From a Physiotherapy perspective, we are seeing more and more overweight patients coming in with pain and disability from osteoarthritis through the hips, spine and knees. The gold standard of treatment for these patients is to increase the supporting muscle strength around the joints, and to advise the patient to lose weight: even losing 10% of their body mass results in significant reductions in pain scores. It is argued that many of these conditions could be largely prevented by keeping a healthy body weight and staying active in the first place. After all, these are weight-bearing joints, and if you are overweight you are asking a lot of your joints every time you move. Similarly, from an Exercise Physiology perspective, we see many patients giving us highly creative “barriers” to exercise – reasons why they can’t or won’t prioritise physical activity in their lives, even when they are in pain and significantly overweight. It is not uncommon to have patients say they would rather have surgery to “fix” their problem, than to increase their activity and allow their body to become stronger and lighter. I am certain that a large part of this mindset comes from how “normal” it has become to be sedentary and overweight. But does that make it OK? Do you want to be “average”, if that’s what “average” has become? Do you want to live to a ripe old age, only to be overweight and in pain for the majority of that time? I certainly don’t! It is more important than ever to keep our kids active, healthy and happy. Structured exercise is not only crucial for developing little minds and bodies, it is also important for social and health reasons too. Getting into the habit of being active early on can set you up for a lifetime of good habits, which is a gift that you can give your children for life. For kids 5-17 years of age, aim for at least 60 minutes of moderate to vigorous activity daily; and up to several hours daily to achieve even greater health benefits. Ideally this activity will be a mixture of strength and aerobic activity, which is where structured sports like soccer and netball, and active family time like cycling and walking the dog all come into the mix. Of most importance is the new recommendations to limit use of electronic media (TV,computers, ipads etc) to less than 2 hours a day. With childhood obesity on the rise, it is more challenging and hence more important than ever to aim for these goals. Everyone is unique with their daily lifestyle, job requirements, and previous injury and health history. If you need help fitting these guidelines into your lifestyle, or have concerns about previous health issues or injuries, a few sessions with an Exercise Physiologist will help you to work out a program that you can do on a daily basis, without pain, and ideally with ease. Research has shown us time and time again that the most successful activity programs are achieved when the whole family gets involved and supports one another. Our children model themselves off our behaviours – from food to exercise to language, and they are facing the most sedentary generation in history: let’s teach them from a young age how to be anything but “average”! Healy, G.N., Dunstan, D.W., Salmon, J., Shaw, J.E., Zimmet, P.Z., Owen, N. (2008) Television time and continuous metabolic risk in physically active adults. Med. Sci. Sports Exerc. 40(4) 639-645. One of the most common misconceptions among the general public is that one must “rest” while injured. I’ve lost count of how many times I’ve had one of my Pilates clients call to cancel “because they have back pain”. They should be coming to Pilates because they have back pain! Often the assumption is that the injured or painful structure needs to “rest”. Rest from aggravating activities? Most definitely. Rest from all activities? Definitely not. The body requires blood flow, nutrients from the inflammation process, and gentle movement to stimulate healing. If this can be done with minimal pain, you have a win-win situation: the body can get stronger while it heals itself. Conversely, one of the most common misconceptions and fears amongst athletes is that their physio or doctor will tell them to stop their activity when an injury is looming, so they avoid making an appointment. This often results in delayed diagnosis and treatment, worsening of their condition and significantly prolonged time off their sport in the long run. The earlier the injury is treated, the more likely it is that the athlete will be able to continue with a modified version of their usual sport – which can mean faster healing, improved biomechanics through careful analysis and correction, and less time on the sidelines. 1) Activity Modification is the key. Be creative! Your Physio and Exercise Physiologist will be able to develop a program for you to follow, no matter what the injury, how long you’ve had it, or how you got it. Even athletes with broken legs can be training hard in the gym and possibly the pool if done correctly. 2) Golden Rule: Pain must stay below 2/10. Some pain is good, and normal, in order for healing to occur. 80% of an injury’s healing occurs in 20% of the time (ie if a lumbar disc injury takes 10 months to get back to 100%, 80% of the gains will be achieved in 2 months, then next 8 months will be spent getting the final 20%). Why wait the whole 10 months to get back to fitness? The amount of muscle loss and degeneration achieved in that time may well set you up for a lifetime of back injuries in the future. Staying fit through swimming, walking, Pilates, etc and keeping the pain <2/10 may well prepare you for a lifetime of less back pain. 3) Athletes will often “train” harder when injured than when not. Look at it like a time to rebuild the body and to work on any weaknesses that caused your injury in the first place. Ask an elite athlete how much time they had to lay around and feel sorry for themselves after their last major injury. Chances are, they will tell you how it was the hardest training they’ve done – hours spent in Physio and Exercise Physiology sessions, the gym and the pool. Not to mention nailing their nutrition and recovery in between those sessions with extra sleep, massage, ice baths and so on. We are all designed to be athletes, even if our modern “sitting” lifestyle has made that hard to believe. So a middle aged man with a lumbar disc injury is no different – he should be doing more activity when injured in order to assist the healing and make him stronger than before the injury. Look at it like this: the injury is a cry from your body that something is not right. The rehabilitation process is your chance to fix that, so that you never have to experience it again. 5) Its never too early to see your Physio; prevention is the best cure. My patients often come in with full-blown injuries, such as low back pain or chronic plantar fasciitis. When I’m taking their history, they say that they first experienced the pain months ago and that it’s been progressively getting worse, and yet it’s taken them this long to see me. They sometimes feel as though the problem has to be “serious” to warrant a visit – this couldn’t be further from the truth! Had they come in when the pain first surfaced, the treatment would have been so much more efficient and the consequences much less significant. Your physio can also help with prevention of injuries. If you know you have a job where you sit a lot, then it might be worth chatting to your Physio about some strategies to prevent the onset of neck and back pain – being proactive is the key. Physios and EP’s are well-trained to work with you to find an exercise program that is safe for your body, that fits in to your lifestyle, and that you enjoy doing. The human body is an amazing specimen, capable of adapting to most things that we throw at it. Your body puts up with a lot – why not give it something back by prioritising healthy ageing? You only have one body, after all. Adams, T; Band-Entrup, D; Kuhn, S.; Legere, L; Mace, K. (2013) Physical Therapy Management of Knee Osteoarthritis in the Middle-Aged Athlete. Sports Med Arthrosc Rev 21:2-10. Clinical Pilates is a system of safe and effective exercises which meet your specific individual needs. Clinical Pilates is used by our physiotherapists to treat a wide range of injuries and conditions, ranging from low back pain and chronic pain to hypermobility and chronic fatigue syndrome. It is also used by elite athletes and dancers to improve essential movement patterns and enhance fitness and performance, as well as assisting with injury prevention. By working into your body’s preferred movement, Clinical Pilates improves your mobility, stability, balance, posture and overall function. Clinical Pilates offers a system of safe, effective and highly specific exercises appropriate for all ages. There are stages of exercises that you can progress through that will allow you to see the improvements in your strength, control and healing. There are important differences between regular Pilates and Clinical Pilates. Regular Pilates is conducted by a Pilates instructor, whereas Clinical Pilates is prescribed and supervised by a Clinical Pilates trained Physiotherapist or Exercise Physiologist (E.P.). This difference is very important because a Physiotherapist or E.P., unlike a Pilates instructor, has an in-depth knowledge of injury, pathology, bodily function, healing and movement patterns. This knowledge allows a Physiotherapist to assess each patient and determine which exercises will be the most effective for each individual. This becomes especially important if you have any history of injury – whether it be low back pain, whiplash, osteoporosis, or if you are an athlete coming back from an injury. There will be certain exercises which need to be adapted specifically for you so to avoid further harm; this is something that only a Physiotherapist or Exercise Physiologist is trained to do. Like any form of exercise, Pilates can be wonderful for fitness, however still has the potential to cause injury or pain if not prescribed and monitored in the correct way. At FirstIn Physio, Pilates comes in many forms so that the benefits can be enjoyed by everyone. You will often see our Physiotherapists using the Pilates Reformer as part of treatment sessions, to assist in re-establishing correct movement patterns in the body following injury. Our Exercise Physiologists also use the Reformer during exercise training sessions, which can serve a number of purposes. Some athletes coming back from surgery of the hip or spine will need a program based on core work and mobility and the Pilates Reformer becomes a mainstay of their rehab program. It can also be used for high-level athletes as part of a strength session and to work on weaknesses in mobility throughout the body, leading to better overall performance, or with stroke patients to assist with rehabilitation. We also use it a lot with dancers in order to train their technique to bring them to a higher level and make them more injury-proof. FirstIn Physio offers a number of small group classes at the clinic, designed to cater for different levels of fitness and skill, from beginner through to advanced. The classes are an excellent way to build base core strength in a fun and supervised environment, allowing your physio to closely watch your technique as you perform the exercises and to give you variations based on your individual needs. These classes are a lot of fun and tend to fill up fast! We also offer male- and female-specific classes. One of our Physiotherapists or Exercise Physiologists can work closely with you to develop your own Pilates program using the equipment at the clinic combined with matwork exercises. Once you feel confident and competent with your specific program, you can advance to an independent program, where you will be able to use our studio and its equipment at regular intervals on your own. A Physiotherapist will regularly monitor your program and prescribe more advanced exercises as you progress. Clinical Pilates has been shown to prevent injuries, improve balance and stability, strengthen and tone muscle and improve bone density. It is a great form of general exercise to improve fitness and improve technique in specific movements, such as dance, running and golf. It is appropriate for all age groups from kids through to the elderly and is safe and fun! For more information, please do not hesitate to give our staff a call and find out more about the amazing benefits of Clinical Pilates at FirstIn Physio! The gold standard in health care in one central location. Physiotherapy, Exercise Physiology, Strength & Conditioning Programs and Clinical Pilates to see your rehabilitation through from the injury stage through to return to optimal performance. Every human body is unique and presents with a different set of challenges. We understand that everyone has different goals - whether it be pain reduction, improved function, or enhanced sports performance - and are committed to working with you to achieve those goals. If you haven't had success in the past, or are sick of living with pain, then give us a call today - we would love to be able to work with you to improve your quality of life and to get the most out of your body. Life is too short to be living with pain!